Fixer Upper is a popular show about buying an inexpensive house that needs work, then putting your leftover money toward “fixing it up.” The big reveal of the finished product is always amazing. However, what if the thing that needs fixing is a hammertoe, not a house? What tools can you use to treat hammertoes so they’re straightened out as good as new? 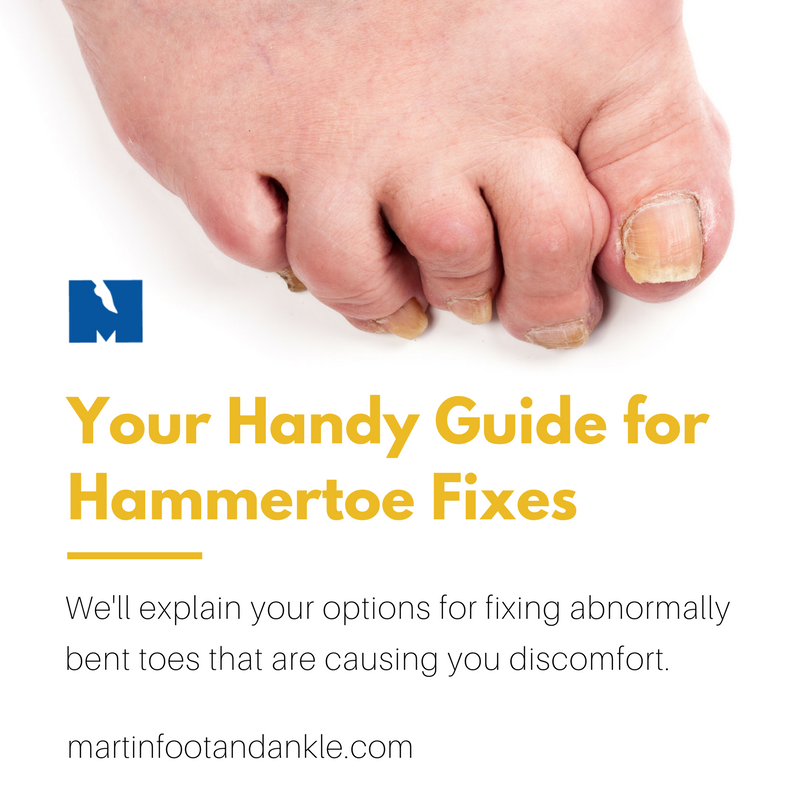 Here’s a handy guide for hammertoe fixes you’re sure to find helpful (and maybe even amazing). Shoes with wide and deep toe boxes and heels less than 2 inches tall. Make sure there’s a thumb’s width between your longest two and the end of the shoe – that’s key! Visit The Right Shoe for stylish yet functional shoes that fit and feel as good as they look. Ice and medication. These can be used to reduce swelling and pain. Exercises to restore muscle and tendon balance. Splints to hold your toe in a flat, normal position. Orthotics that distribute weight evenly and direct pressure away from your problem toe. Surgical techniques. These should be considered if your hammertoe has stiffened or is causing you chronic pain. Procedures vary depending upon the severity of your hammertoe. Tendon Transfer: used on flexible hammertoes, this involves rerouting the tendon from the bottom to the top of the toe so that it pulls the bent joint straight. Joint Resection: if your hammertoe is “fixed,” or stiffened to the point that it is stuck, an incision is made at the top of the toe and the end of the bone is removed. Ligaments and tendons may also need to be cut and adjusted, and temporary pins will be used to hold your toe in proper position. Fusion: another fix for “fixed” hammertoes, this entails cutting the ligaments and tendons as well as the ends of the bones at the joint. These will then be aligned and straightened and held in place with screws or pins while the ends of the bones grow together. Typically, these procedures can be done on an outpatient basis, meaning you can return to your home the same day! So, there you have it – a whole tool box of hammertoe fixes to choose from, and the big reveal of your straight toe after them just might amaze you as much as an awesome home makeover! To learn more or to make a fixer upper appointment for your hammertoe, just dial (717) 757-3537 to reach any of our PA locations.